Remaining active during a pregnancy may help reduce some discomforts and help prepare the body for delivery. 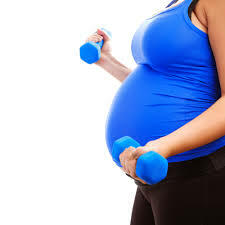 Acute exercise generally increases oxygen uptake, heart rate, stroke volume, cardiac output, and lung volume during pregnancy. Remember to complete the “PARmed-X for Pregnancy” health screening prior to participation in a prenatal fitness class or other exercise. Medical clearance should be obtained prior to exercise for women who were sedentary prior to pregnancy or have a medical condition. Intensity: Moderate intensity exercise is encouraged for women with a pre-pregnancy body mass index (BMI) of less than 25 kg per squared meter. However, women with a pre-pregnancy BMI of greater than 25 kg per squared meter should engage in light intensity exercise. Time: More than 15 minutes per day is recommended. Individuals may gradually increase the duration to a maximum of 30 minutes per day of moderate intensity exercise for a total of 120 minutes per week. A 10-15 minute warm-up before exercise and 10-15 minute cool-down of light physical activity after a training session is recommended. Type of Exercise: Use large muscle groups in dynamic, rhythmic physical activities. One to three sets of 10-15 reps with approximately 2-3 minutes rest in between each set is recommended. Engage in light to moderate resistance exercises. The following are sample routines according to different trimesters from Brad Schoenfeld (NSCA).